Alan Sidney Patrick Rickman (21 February 1946 – 14 January 2016) was an English actor and theatre director. He was a well known stage actor in modern and classical productions and he used to be a member of the Royal Shakespeare Company. Rickman was known for being in movies. 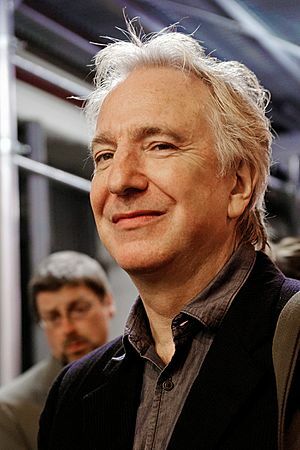 Rickman was born on 21 February 1946 in Acton, London. He studied in London at the Royal Academy of Dramatic Arts. Rickman married his partner of 50 years, Rima Horton, in 2012. He lived in London and in Los Angeles, California. Rickman died in a hospital in London from pancreatic cancer on 14 January 2016 at the age of 69.. He was cremated in the West London Crematorium in Kensal Green on February 3, 2016. His widow, Rima Horton, kept his ashes. In Harry Potter and the Philosopher's Stone (Sorcerer's Stone) Rickman portrays Professor Snape, a bad guy who hates Harry. Severus hated James Potter, Harry's father, because he took Lily from him, this is another reason he hates Harry so much because he looks like his father. However, in Deathly Hallows Part 2 we discover that Snape is in fact a hero. He sacrifices himself to save the wizarding world. Harry recognises this and names a child after him in honour of his braveness. Alan Rickman Facts for Kids. Kiddle Encyclopedia.